Dutch rabbi; born at Amsterdam 1847; died at The Hague Oct. 24, 1898; studied at Dünner's theological seminary (1862-74) and at the University of Utrecht (D.D. 1874). 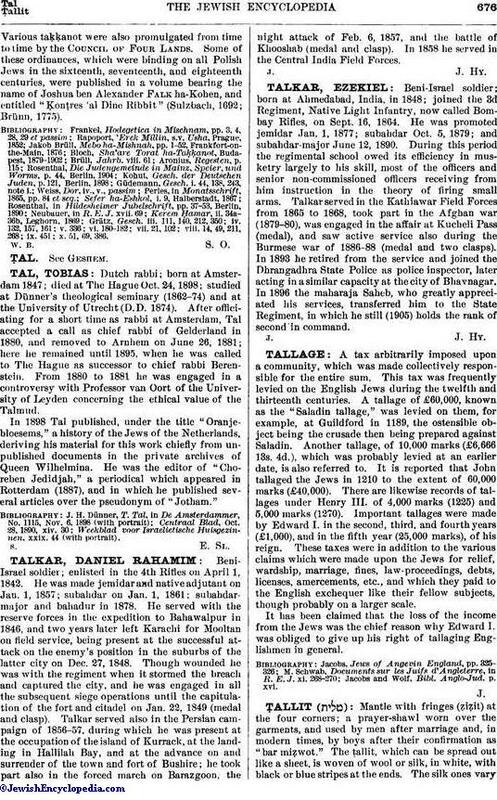 After officiating for a short time as rabbi at Amsterdam, Tal accepted 'a call as chief rabbi of Gelderland in 1880, and removed to Arnhem on June 26, 1881; here he remained until 1895, when he was called to The Hague as successor to chief rabbi Berenstein. From 1880 to 1881 he was engaged in a controversy with Professor van Oort of the University of Leyden concerning the ethical value of the Talmud. In 1898 Tal published, under the title "Oranjebloesems," a history of the Jews of the Netherlands, deriving his material for this work chiefly from unpublished documents in the private archives of Queen Wilhelmina. He was the editor of "Choreben Jedidjah," a periodical which appeared in Rotterdam (1887), and in which he published several articles over the pseudonym of "Jotham." Weekblad voor Israelietische Huisgezinnen. xxix. 44 (with portrait).